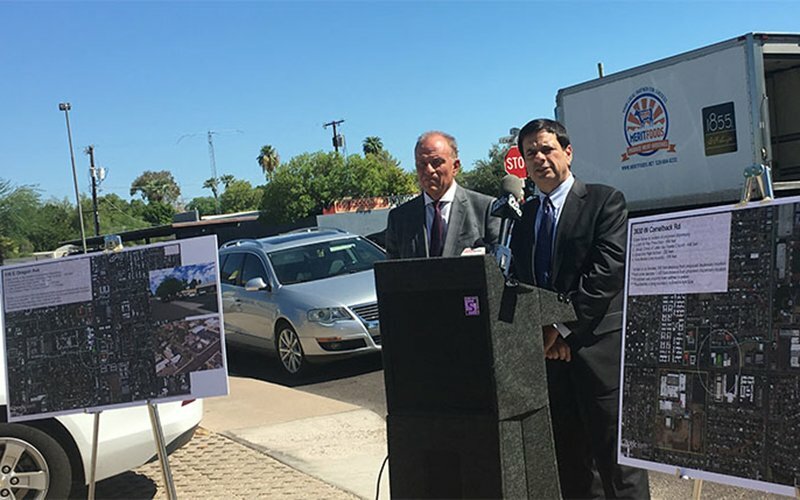 PHOENIX – Community activists, including a former Phoenix mayor and Arizona attorney general, believe loopholes in Arizona zoning laws could allow medical-marijuana dispensaries to open too close to schools, homes and religious institutions. More than 700 applications for medical-marijuana dispensary licenses have been filed, according to azcentral.com. In October, only 31 of those will be awarded a license to sell. The Arizona Department of Health Services enforces zoning regulations that prevent dispensaries from opening near schools or places of worship. But Gordon, former Arizona Attorney General Grant Woods and others said Monday the variances are loopholes in the law. But a former DHS director said it’s unlikely that the department would grant licenses to dispensaries if the locations don’t fall within the zoning laws. Dispensaries have to 500 feet away from residential areas and no more than one-quarter of a mile from schools and places of worship. Will Humble was DHS director in November 2010, when voters approved the Medical Marijuana Act. He helped draw up the licensing requirements for dispensaries, including making sure zoning approval was needed before licenses can even be granted. “There’s no real way to avoid final zoning,” said Humble, who works at the University of Arizona health sciences department.